The USS Arizona Memorial located in Pearl Harbor is one of the most popular tourist attractions in Honolulu and the Hawaiian Islands; the memorial has come to commemorate all military personnel killed in the Pearl Harbor attack. Contrary to popular belief, the USS Arizona is no longer in commission. As a special tribute to the ship and her lost crew, the United States flag flies from the flagpole, which is attached to the severed mainmast of the sunken battleship. 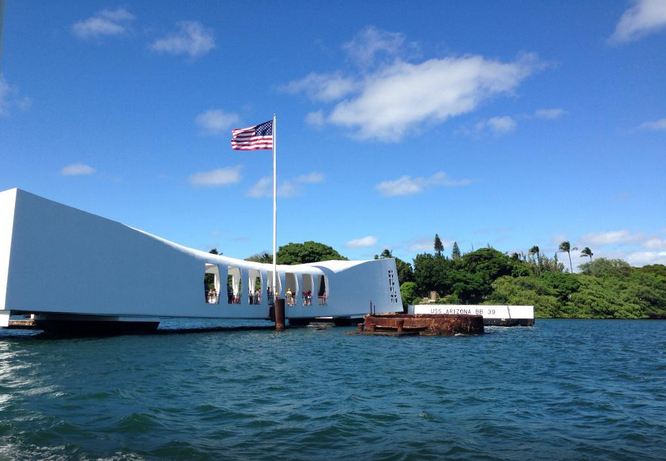 The USS Arizona Memorial has come to commemorate all military personnel killed in the Pearl Harbor attack. Don't miss a chance to visit this inspiring Memorial and honor the dedicated men that sacrificed their lives. Attractions, Vacation Rentals, Restaurants, etc. Hawaii Attractions, Reviews, Activities, etc.